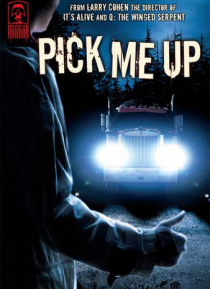 On a desolate stretch of mountain road, two urban myths collide in one night of chilling carnage - Wheeler (Michael Moriarty of LAW & ORDER, THE STUFF) is a friendly truck driver who enjoys slaughtering hitchhikers; Walker (Warren Kole) is a charming hitchhiker who prefers to butcher anyone who gives him a ride. Caught in the dueling psychos' depraved game of cat and mouse, Stacia (Fairuza Balk of… THE CRAFT, AMERICAN HISTORY X) must find a way to outwit Wheeler and Walker before it is too late. But is the most horrific twist of all yet to come? Laurene Landon (MANIAC COP, HUNDRA) co-stars in this perverse tale written by 'splatterpunk' author David J. Schow (THE CROW, TEXAS CHAINSAW MASSACRE: THE BEGINNING) and directed by Master Of Horror Larry Cohen.